Deciduous forests, woodland edges, shrubby fields, orchards. May 11, 2012 – First sighting of the year at backyard feeder, Lakeville, MN. 5/12/2014 – Two at backyard feeder, Lakeville, MN. 5/19 - 5/20/2014 – One at backyard feeder, Lakeville, MN. 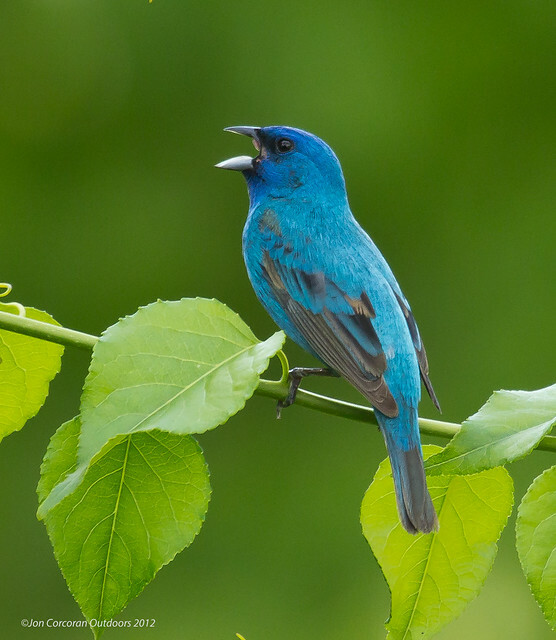 This sweet little video celebrates the Indigo Bunting and its song. It features footage I obtained from Land Between the Lakes, Kentucky. Look carefully at the second clip in the sequence—you can see the bird's breath condensing when he sings! The strident, high-pitched, lively song of the male is usually made up of a series of doubled phrases: "sweet, sweet, chew, chew, see-it, see-it". The Indigo Bunting gets its name from it's beautiful indigo blue color. Although quite common in shrubby clearings over much of the East, this species is not well known to the general public and is often confused with the Eastern Bluebird (there are only a handful of North American birds that are primarily blue in coloration). Indigo Bunting singing on June 2, 2010 in West Salem Wisconsin. Video captured with a Canon 7D camera. 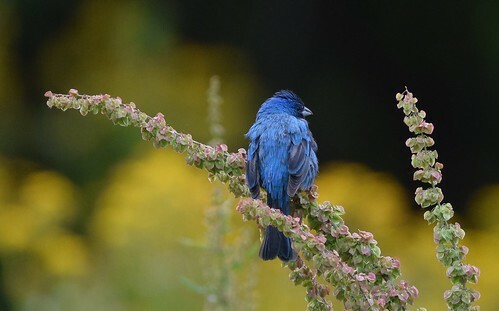 Brilliant azure male Indigo Buntings sing conspicuously from high perches, telephone lines, and wood edges. Females are drab and unobstrusive, as are winter-plumaged birds and immatures, which can form sizeable flocks in the fall in areas with abundant grain. This habitat shift--from scrublands, wood edges, and forest clearings to grasslands, agricultural areas, and weedy patches--is something that is understood by the STEM models. Please keep in mind that the data that underlie the pretty animated maps are in fact much richer and reveal many additional bits of information about seasonal habitat preferences. When we plot the monthly relative importance of deciduous forest to the predictions in these models, we find that it becomes much less important from August to October, which is a time that Indigos are leaving their Breeding areas and foraging in fields. In the future, we hope to be able to provide more of this data as well. Some of the fall habitat shift can be seen in the animation. The lower Mississippi River valley is a broad swath of agriculture, especially in northeastern Louisiana. A common pattern on these maps is to see that area show up as bright (e.g., Horned Lark) or dark (e.g., Brown-headed Nuthatch, Wood Thrush). The reason for this is the broad, landscape scale habitat that dominates here (agriculture) and the comparatively tiny amount of forest in tis area, as compared to all the areas around it. Of course, the lack of forest here is quite a sad thing, since the woodlands of this area used to be some of the most majestic prior to being entirely converted to agriculture. The migration of Indigo Bunting is one of our favorite examples and the STEM models really show it quite well. In late March and April the species arrives on the Gulf Coast, after crossing directly from the Yucatan. 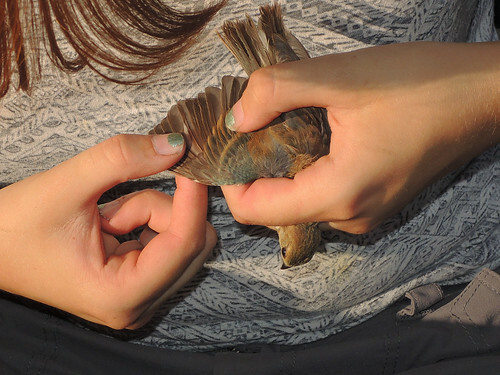 A wedge of arriving buntings surges north through the Mississippi River Valley and spreads out from there over the course of almost 1.5 months, a rather protracted arrival when compared to other landbirds. Birds at the northern edge of their range in New England do not fill in their territories until late May. The fall movement heads south back across and around the Gulf of Mexico primarily during October. I seen an Indigo Bunting our My kitchen window in the neighbors tree above his bird feeder. Caught a picture of him in a pine tree. Quite a treat! Just happened to see him this afternoon thought it was way early. I have not observed an Indigo Bunting at our feeder before. These are supposedly common in eastern US but I did not notice them in our yard before today. I have seen four on my back patio. never seen them at my feeder before. Spotted at the bird feeder on the back deck.